Preheat oven to 375 degrees F. Spray donut pan with non-stick spray (I use Baker's Joy). Set aside. Combine 1 cup granulated sugar and 3/4 tsp cinnamon in a shallow baking dish, bowl, or paper bag. Set aside. In a mixing bowl, combine dry ingredients (flour, sugar, baking powder, spices and salt) and whisk. In another large mixing bowl, beat the chai tea, vegetable oil, vanilla bean paste, and egg until combined. I use a hand mixer for this. Add dry ingredients, half at a time, mixing until just combined after each addition, scraping the sides of the bowl if necessary. Pour batter into a pastry bag or large ziploc bag, snip off the tip, and fill donut molds of the pan about 2/3 full. Bake donuts 10-12 minutes, or until the spring back when lightly touched. Remove from oven and let cool in pan for 2-3 minutes. Invert pan over a cooling rack to remove donuts, dip them in melted butter, then toss them in the cinnamon sugar mixture. Return to cooling rack to finish cooling. 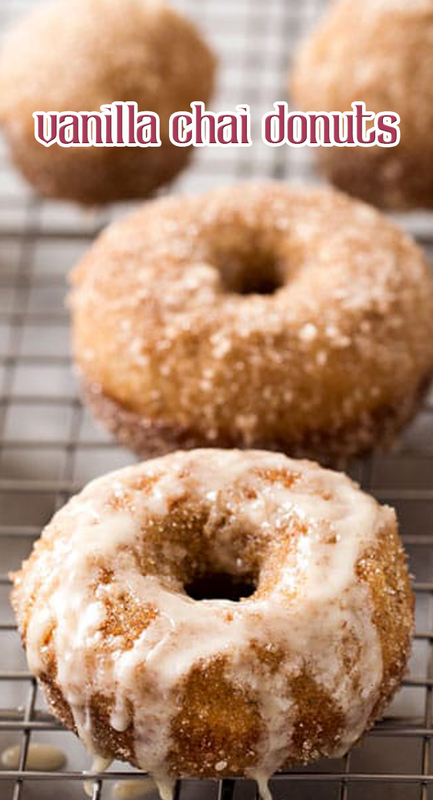 If making the glaze, add powdered sugar to a mixing bowl and add tea, whisking to make a thick, yet pourable glaze. Drizzle over donuts, or serve in a small bowl for dipping.